Small kitchens have bothered many homeowners for long. But modern design has ensured better living in small spaces. 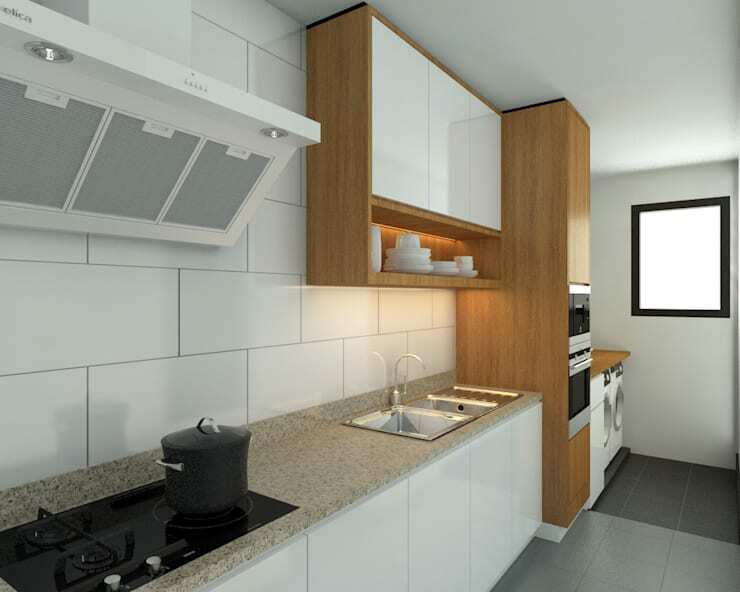 Many apartment homes in Malaysia now have a kitchen in less than 80 square feet space. If you are an owner of a tiny kitchen too then rest easy. We have plenty of design inspirations for your tiny kitchen today. The interior of this otherwise predominantly white kitchen has been decorated with a dash of spice. 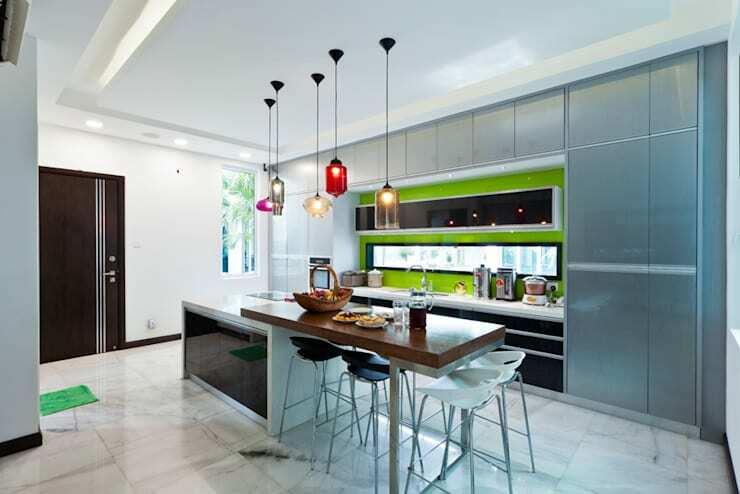 Colourful bar stools and dark pendant lighting fixtures contribute to its delectable décor. The kitchen worktop also boasts of a warm hue. 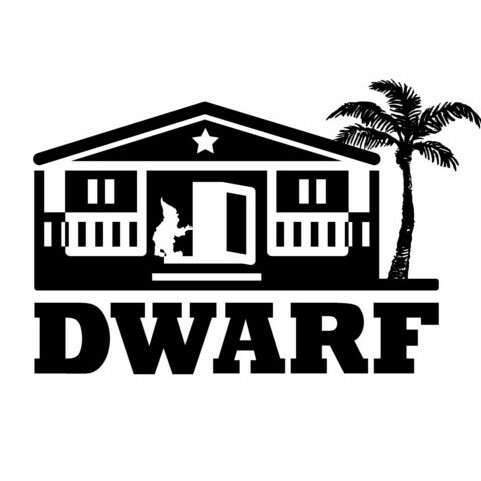 Check out some more small home ideas from here. The contrast of dark kitchen worktops has a striking effect on the interior of this small kitchen. 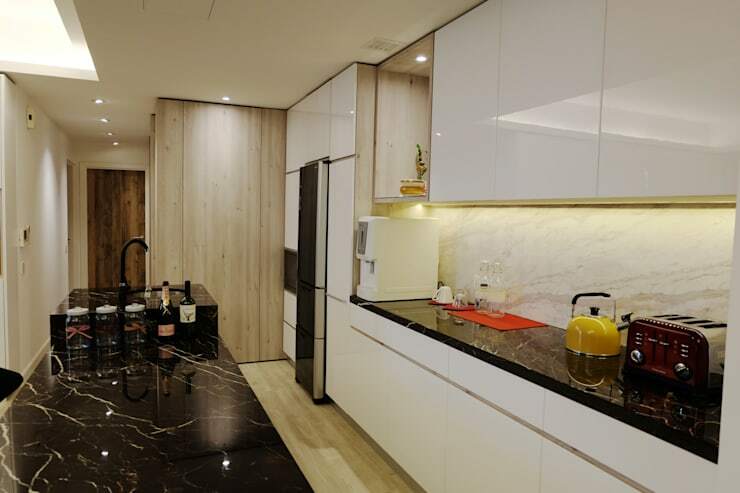 It is decorated with cabinets having shiny white laminated doors. A spacious kitchen island makes work easy for those who spend time in this space for long. The functional design of this kitchen that strikes you the very moment you see it. But it has no shortage of charm. A somewhat surprising colour scheme has been further accentuated with the help of colourful lamp shades. The durability and elegance of stone has been chosen for the flooring. The U-shaped design proves to be very functional in this space. 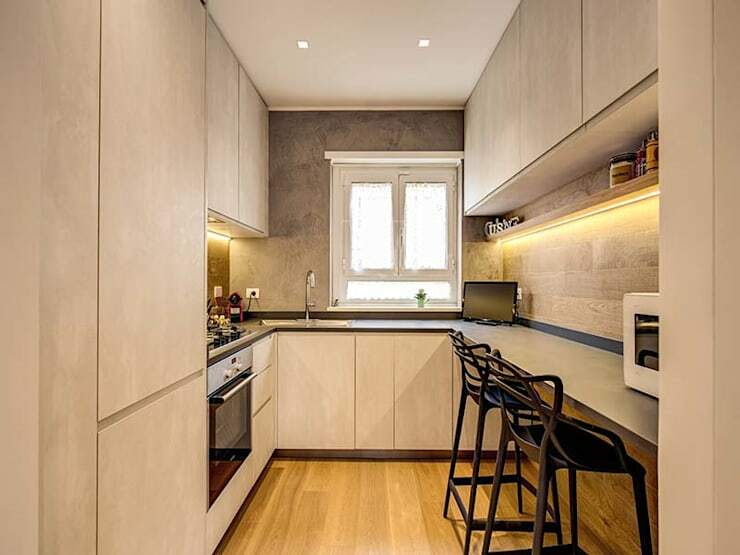 Despite the smallness of its size, the kitchen planner has chosen a U-shaped layout for this small kitchen. 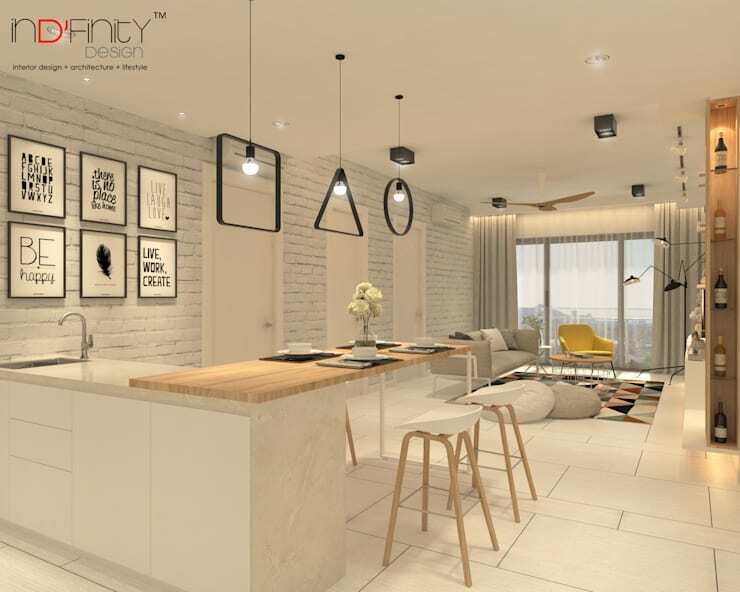 It is decorated with wood flooring, backsplashes decked up with ceramic tiles and built in cabinets. A colour scheme dominated by black and white seems to be particularly suited to the interiors of modern homes. The owners of this home preferred this colour scheme for their kitchen too. It has a stylish kitchen island with seating arrangement. The square shaped space has been put to optimal use. The simple design of this tiny kitchen is one of its biggest attractions. The designer has chosen appropriate built in cabinets for this space. The light filled interior, thanks largely to the ceiling mounted fixtures, make the space look cheerful and ideal for spending a long time. This tiny kitchen has a L-shaped layout. Interiors inspired by Scandinavian décor are in vogue for some time now. The owners of this house opted for a Scandinavian design in their open plan kitchen which occupies one part of the living room. It is stylised with exposed brick walls painted in white. 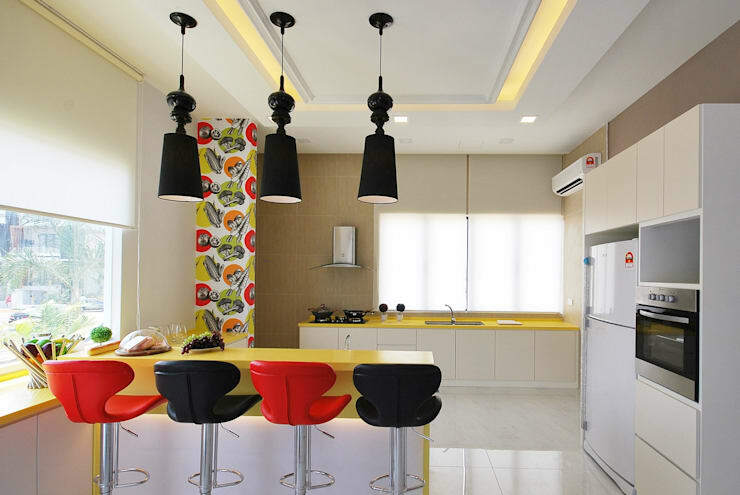 Modern kitchen design emphasises on minimalism and simplicity of style. 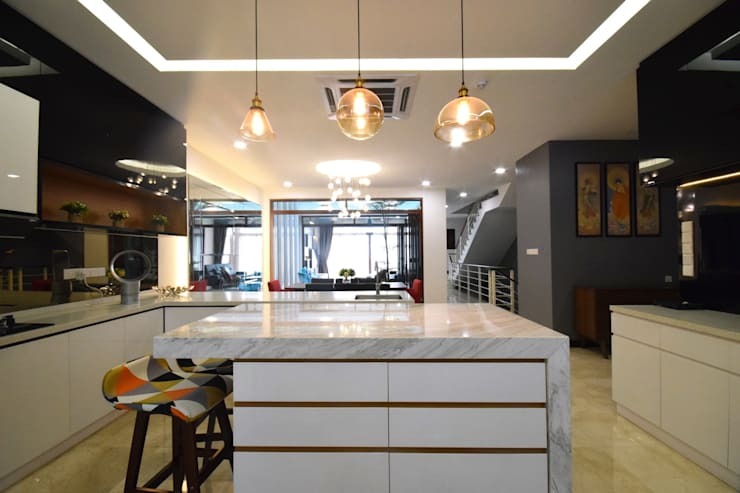 This one boasts of a light filled interior accentuated by the use of ambient lighting fixtures and under cabinet LED lighting. The ceiling décor also deserves a special mention. 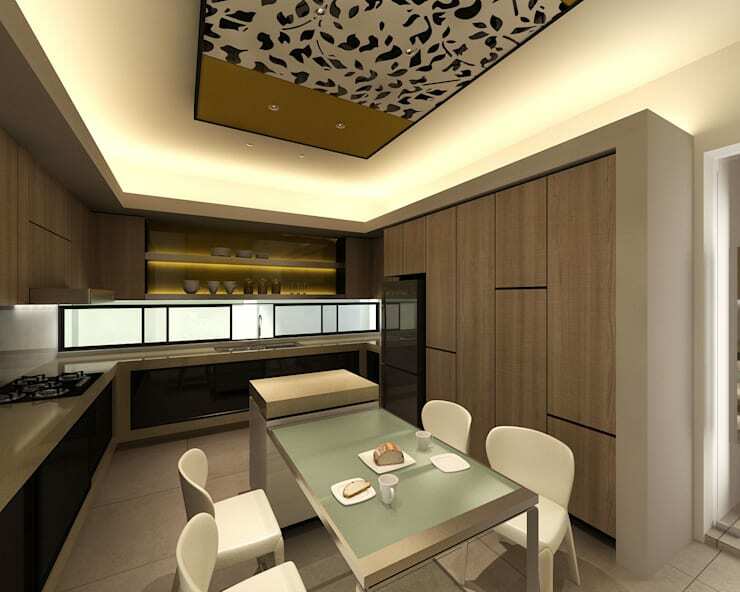 Galley kitchen layout is perfectly suitable for a room with an oblong shape. To maximise the storage space you may opt for a double galley kitchen. The one of the image above shows you how to make the best use of the available space. The furthest corner of the kitchen has been converted into a utility room. Washing machines and driers occupy this space. 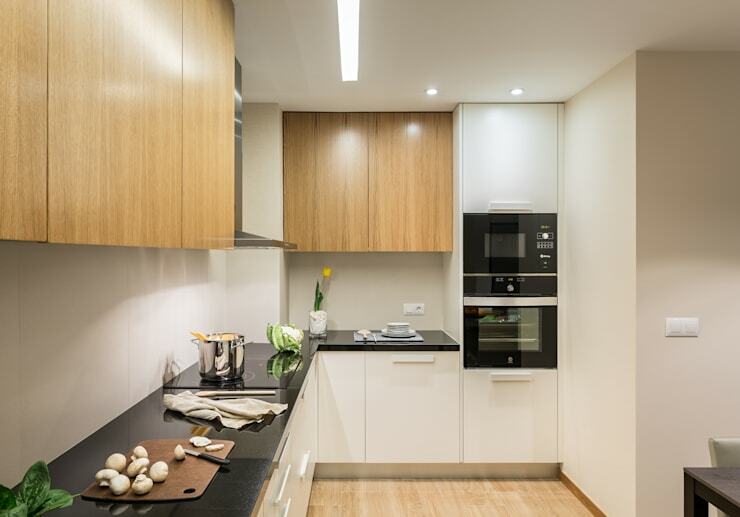 This amazing wood clad kitchen interior is bound to earn many admirers. Its small space is decorated with cabinets, kitchen island that double up as a workspace and storage room. 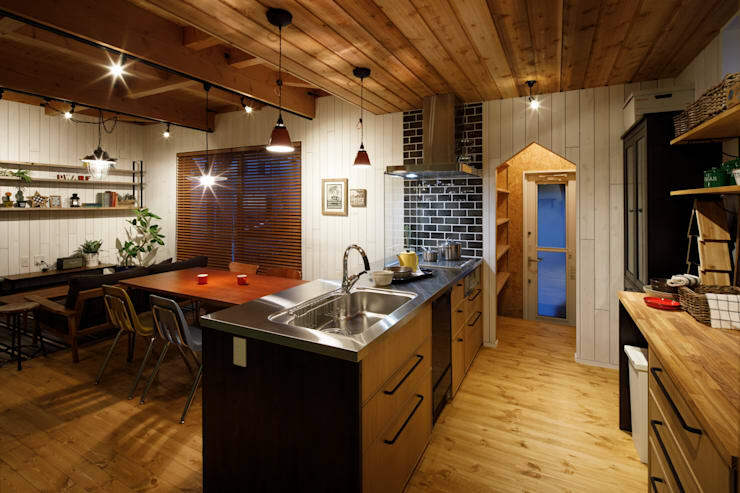 Both the flooring and the ceiling is made of wood. The furniture is also designed from natural timber. The store room, however, has cork walls. This is something that you may consider having in your home too. Cork has unique texture and is very supple. Besides, it is an excellent insulation material. Learn some affordable ways of injecting new life in the ambience. Which of these small kitchen designs did you find most interesting?